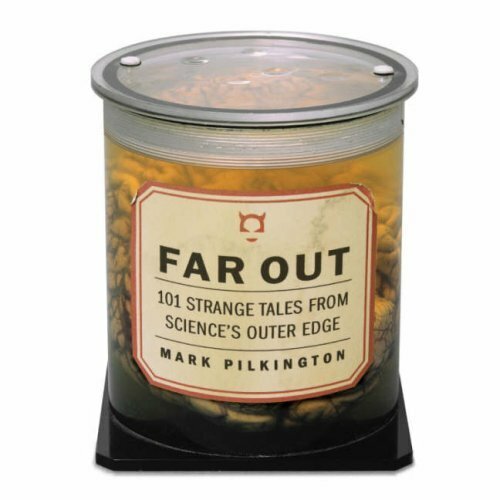 So my first full book hits the shelves this week: FAR OUT: 101 STRANGE TALES FROM SCIENCE’S OUTER EDGE – published by Disinformation and available wherever interesting ideas are sold. A miscellany of 101 short histories from the annals of weird science, it’s culled from the columns I wrote for the Guardian newspaper’s now-extinct Life section between about 2003 and 2005. From the Aquatic Ape Hypothesis to Zero Point Energy via the Hieronymous Device and Erototoxin, I’ve tried to distill complex, often mind-boggling ideas and stories into concise, hopefully pithy and entertaining tinctures that can safley be taken at up to six times a day. I recommend use in the toilet, at bedtime or on short journeys (though not while cycling or operating heavy machinery). Disinformation have done a great publishing job. The cover, as you can see above, is fantastic, and the end papers and section divides come in a wild radioactive green – as one friend puts it, the international colour of weird science. The book is a handy CD-size and satisfyingly thick at 236pp, and should fit snugly into the lab coat, or look great in a padded cell. Hopefully this clutch of stories will inspire, confuse, enthrall, appall and entertain the mad scientist in everybody’s lives. By it from your local independent book shop, or if you must, from Amazon UK (who have the title wrong!) / USA. Journey to the wilder shores of science with this quirky, compulsive, witty and occasionally thrilling new book from the author, broadcaster and science iconoclast Mark Pilkington. Did you learn about science in school? Did you wonder about the experiments that didn’t work out? The inventors who crashed and burned? The facts that turned out to be fiction? In this amazing little book, Mark Pilkington charts some of the more curious byways, scenic detours and inspired failures of scientists, inventors and, yes, crackpots, over the past few hundred years. From the Aquatic Ape Hypothesis to Zero Point Energy, via the Hieronymous Machine and Phlogiston, Far Out tells the stories that are all too often ignored, lost or simply forgotten by conventional science books. Some of them are perhaps best left languishing in the margins of history, but others may yet change our future. Covering physics, chemistry, biology, archaeology, psychology and other areas yet (or never) to be inducted into mainstream science, including Radionics, Keranography, Erototoxin, and Remote Viewing. Far Out contains 101 tales of science that was, science that might have been, science that never should have been, and science that may yet be. MARK PILKINGTON lives in London and edits the highly praised anthology of cultural marginalia Strange Attractor Journal (see www.strangeattractor.co.uk for more information). Mark is an experienced broadcaster and has also written for the Guardian, Fortean Times, The Wire and The Times.